Handy pocket file keeps your papers together. Fully lined, tear-resistant gussets. Made from durable material. 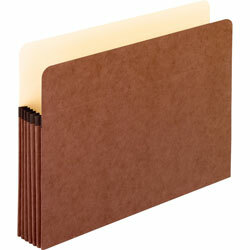 Expandable File Folder Type: Top Tab Pocket; Size: Letter; Material(s): Manila/Red Fiber; Number of Pockets: 1. Paper contains 10% post-consumer recycled content, 10% total recycled content. 8 1/2 x 11 Red Expanding Files from Pendaflex! 124 In Stock today.